This article is about The mini Ghost released for the Toronto Fan Expo. For the Comic-Con exclusive, see The Ghost Starship (Comic-Con exclusive). This mini model of The Ghost Starship is an exclusive set that was sold exclusively at the 2014 Toronto Fan Expo from August 28 to 31 2014. 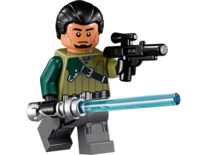 Although this is said to be an exclusive set, neither the minifigure, nor the model appear to be exclusive, leaving the packaging the only truly exclusive part of this set. This is a description taken from Official press release. Please do not modify it. You may have heard the news…something special is coming to Canada! Come August 28 – 31, 2014, more than 100,000 people will gather at the Metro Toronto Convention Centre for a weekend of fandemonium, otherwise known as FAN EXPO Canada™. For LEGO®, the event is about the fans – it’s an opportunity to engage with builders of all ages and offer a fun interactive experience that is unlike any other in Canada. Because YOU are some of the most loyal fans of LEGO, we are offering an advance sneak peak of the FIRST EVER LEGO® FAN EXPO Canada™ Exclusive. 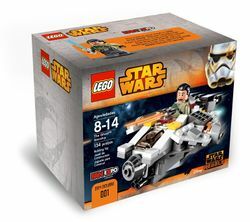 This limited edition LEGO® STAR WARS™ Rebels set features The Ghost™ Starship with Kanan Jarrus™ Minifigure from the upcoming STAR WARS™ Rebels TV series. The set is ONLY available at the LEGO Booth #748 between Thursday, August 28 to Sunday, August 31, 2014, while quantities last. Tickets will be distributed at the booth on a first come, first serve basis when the show floor opens to the public. Quantities will be limited per day and only one LEGO® FAN EXPO Canada™ Exclusive per customer per day. A valid ticket will be required for purchase. For a chance to win one before the show, please check out http://fanexpocanada.com/contests/ for more details! Facts about "The Ghost Starship (Toronto Fan Expo exclusive)"
You may have heard the news…something special is coming to Canada! This page was last edited on 18 August 2017, at 01:03.